In early days, and to some extent in some countries even in these times, in shipping lines, it was thought necessary to furnish the crew with "a gill of rum" as part of their rations, to have it handy for steamboatmen, miners, and many other workmen, including lumbermen. The crews could not be induced to leave the towns where whisky was to be had freely unless they were assured they could get some where they were going. This was the condition in northern Wisconsin when John H. Knapp and William Wilson bought the Upper Mill on the Red Cedar River, June 1, 1846. They found they had bought a small stock of goods including a barrel of whisky. They were both positive temperance men, prohibitionists, and did not at all like the idea of dispensing liquor. They talked it over with the men, but the crew thought they must have it or quit; so it was by suffrance that the traffic was continued for a while. 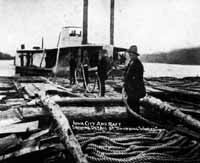 Captain Wilson looked after the sawing of the lumber and the selling of the little stock of goods, making a memorandum of supplies needed, etc. 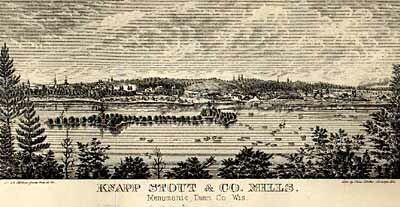 ; while Mr. Knapp took the rafted lumber down the Red Cedar, Chippewa, and Mississippi rivers to the various little towns, where as opportunity offered he sold the lumber, usually having to give considerable time to the purchaser; bought the supplies called for by the memorandum--usually at Galena and St. Louis,--and then returned to the mill, bringing the supplies with him by steamboat to the foot of Lake Pepin, and by canoe, batteau, or keelboat up the swift current to the mill. Discussing the whisky question one day, Captain Wilson said, "Well, Mr. Knapp, you buy the whisky and bring it up, so I have it to sell." "Yes, Captain, that is true, but you make out the list of what you want, and I buy just what your list calls for. If you did not list whisky I would not buy it." 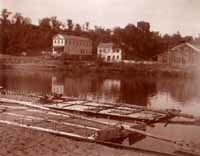 It was the custom when the keelboat came to "Rapid Across" nearly a mile below the mill, for the mill to be shut down, the crew going down to the boat, manning the tow rope, and pulling the keelboat over the swift water; then each one was given a drink of whisky. The next trip after the conversation above mentioned, when the keelboat was at last tied to the bank near the mill, the men came for their usual drink, but did not find any. They turned to Captain Wilson, saying, "There is no whisky." The captain knew the reason, but to ease matters he said, "Mr. Knapp, the men say there is no whisky." "No, Captain, there was no whisky on the list and so I did not buy any." The captain said, "I must have forgotten it when making out the list." It was agreed that he should always "forget" to order it; he did, and this closed the incident to their great satisfaction, and incidentally proved that the men were reasonable, if approached in the right way. Knapp, Henry E. "Forgot to Order." Wisconsin Magazine of History 9 (1925-26) 98-99.